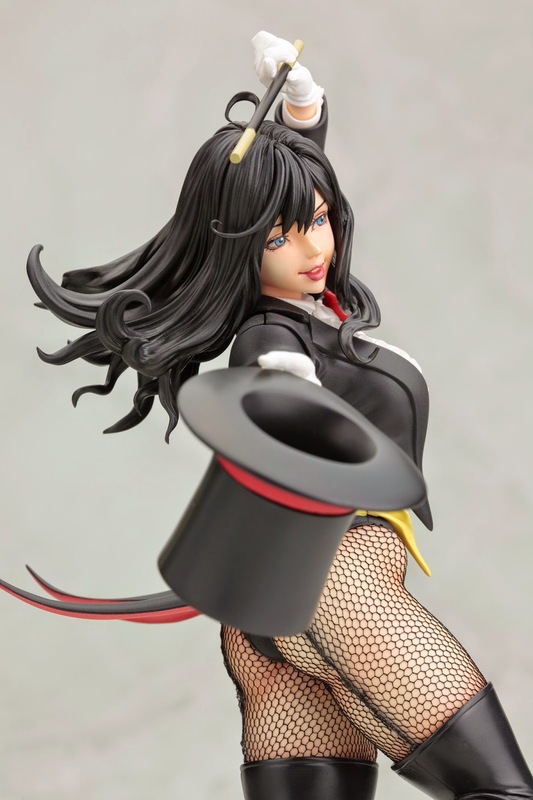 Continuing the lineup of beautiful bishoujo-inspired statues combining the superheroines and villains of DC Comics with traditional Japanese stylings comes a truly magical lady, the sorceress ZATANNA! Daughter of the famous stage magician Giovanni “John” Zatara, Zatanna, created by writer Gardner Fox and artist Murphy Anderson, first appeared in Hawkman #4 (October–November 1964). The character, both a stage magician and a real magician like her father Giovanni "John" Zatara, is known for her involvement with the Justice League, Sentinels of Magic, and more with her unique backwards-English spell casting. 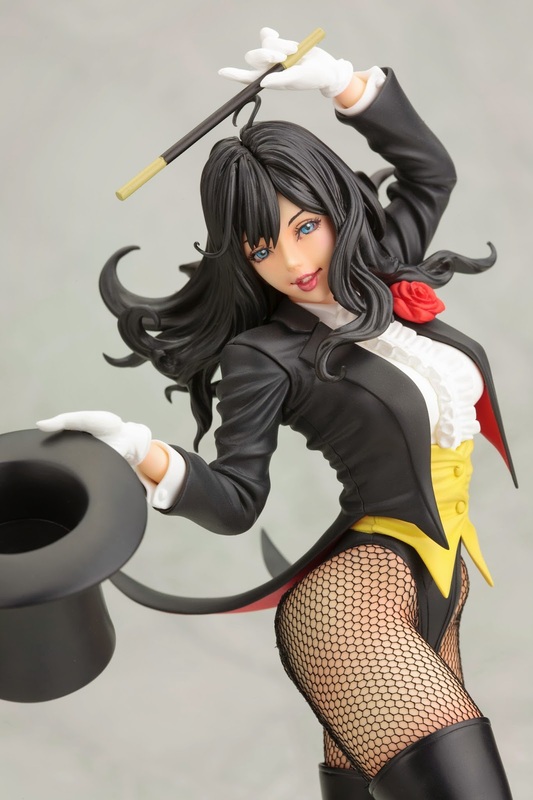 Zatanna appears in this brand new Japanese Bishoujo (pretty girl) styled statue based on original character art by world famous illustrator Shunya Yamashita! Using sleight of hand as well as her considerable beauty, Zatanna distracts you, her audience, as she prepares to pull something out of her hat. The magician looks like she is frozen in mid-performance, wearing her stage costume and sculpted in a unique pose. Zatanna balances on one foot with the other pulled up under her as she leans to the side, dramatically aiming her wand at her outstretched top hat. The beguiling sorceress costume is based upon her father's costume but substituting fishnet stockings and high heels for slacks, white gloves, a black bodysuit, and a complex top with tuxedo elements. 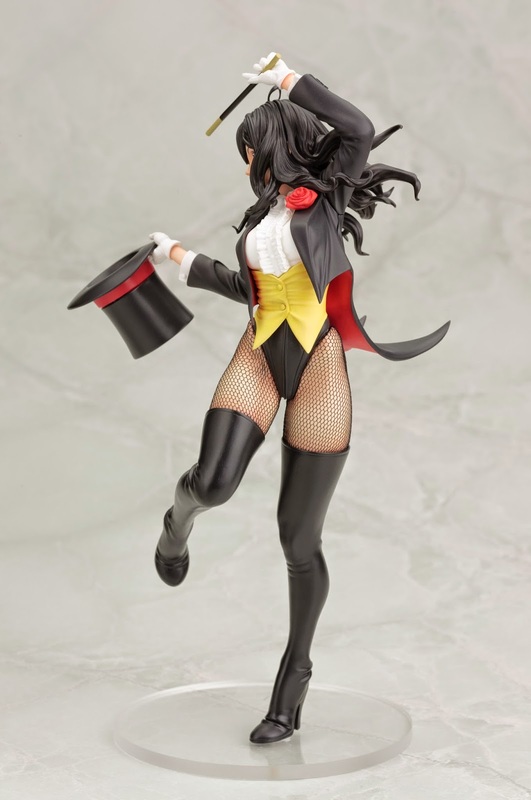 There is an incredible amount of sculpted detail in Zatanna’s intricate clothing as well as her long, flowing hair and captivating Bishoujo-styled face.